Posted on Thu, Mar 15, 2012 : 6:46 p.m.
Michigan coach John Beilein directs the Wolverines during a practice Thursday at Bridgestone Arena in Nashville, Tenn.
NASHVILLE, Tenn. -- When Zack Novak, Stu Douglass, Tim Hardaway Jr. and Trey Burke took the podium Thursday at Bridgestone Arena, there was no smirking. No grinning, no giggles or playful pandering to the national media gathered in front of them. Three years ago, the Michigan basketball team was happy to be here. Last year, they felt fortunate to be here. This time they believe they belong here. This time, it's all business. "I'd say this is a little bit more of a business trip this time around," said Novak, who will lead the fourth-seeded Wolverines into a second round matchup with No. 13 Ohio on Friday (7:20 p.m., TNT) in Nashville, Tenn. "Last year we were just so stoked (to get in) and were really just enjoying it. "We're enjoying it this time around just as much, but there is that extra to it. Guys are a bit more focused, I think." Part of Michigan's renewed focus stems from the fact that the Wolverines have known, realistically, for more than a month that they'd be an NCAA Tournament team. Michigan won a share of its first Big Ten title in 26 years this season, finished the year ranked inside the top 15 and hit the 24-win mark for the first time since 1998. "It's very different," Hardaway said. "Any NCAA Tournament you go to, it's not the same. It's a privilege to be here and we're going to take it like any game. "We'll prepare like it's our last." Michigan guard Trey Burke dribbles during Thursday's practice. Three years ago, Michigan ended more than a decade-long tournament drought, and was able to surprise a few folks by knocking off seventh-seeded Clemson in the first round before eventually falling to a talent-rich Oklahoma squad two days later. Last season, the Wolverines scrambled to just make the tournament after losing six of its first seven Big Ten games. One of the last at-large teams to make the event, Michigan again grabbed a first-day win by crushing Tennessee before falling in heartbreaking fashion to Duke in the round of 32. "Against Oklahoma (in 2009) it was a little different, we felt a little overmatched," Douglass said. "Last year against Duke, that hurt. And it's helped this team stay motivated and focused. "Having that experience is what's really driving us right now." This year, Michigan has the highest seed of John Beilein's coaching career, spent the entire year as a ranked club. Douglass and Novak will be playing in their third tournament in four years, while Hardaway and fellow sophomores Jordan Morgan and Evan Smotrycz are back for a second straight season. Burke? He'll make his first NCAA Tournament appearance Friday, but he's the co-Big Ten Freshman of the Year and a second-team all-American. He says he'll be fine. "It's exciting, really," Burke said. "I'll have some nervousness in me tomorrow because it's my first experience. "But I'll be ready to play." After suffering its ugliest defeat of the season to Ohio State last Saturday in Indianapolis, a loss Douglass said might have been a blessing in disguise, the Wolverines say they've returned to work with a new focus. They're not just happy to be here any longer, and with the season now down to its final hour, the Wolverines are excited to get a shot at proving that. 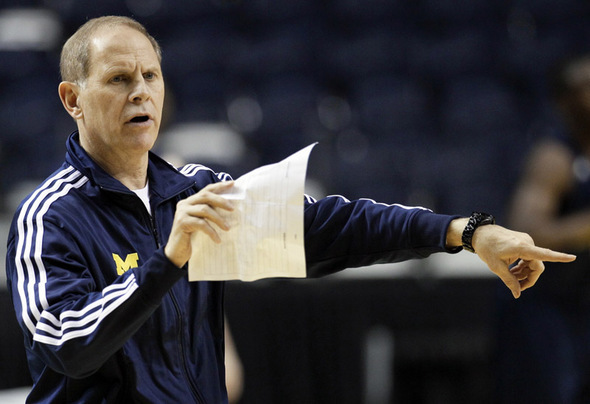 "Monday (after the OSU loss) I wanted to go like 45 minutes to an hour," Beilein said. "We went a little bit longer than that because our kids were into it. They were ready to roll again. "Every practice has been high level, very intense, trying to find ways to make our team better." At the end of every practice this season, the Wolverines broke their final huddle with one message: "Big Ten champs." It's a new season now, though, and at the close of their open workout Thursday in Nashville, the chant was a bit different. Sat, Mar 17, 2012 : 1:36 a.m. Sat, Mar 17, 2012 : 1:31 a.m.
Fri, Mar 16, 2012 : 12:08 p.m.
Fri, Mar 16, 2012 : 4:42 a.m.
Fri, Mar 16, 2012 : 2:42 a.m.
Fri, Mar 16, 2012 : 2:41 a.m.
Fri, Mar 16, 2012 : 2:40 a.m.
Fri, Mar 16, 2012 : 12:11 a.m.
Take care of Business and Go Blue!